And it won’t be by choice, either. The world is full of dangerous bugs. Some deliver enormously painful bites, others are so toxic they can cause amputations, Lyme disease, paralysis, and even dea th. On the other hand, there is another type of tick that’s so innocuous but carries with it the ability to change your life forever. It’s called the Lone Star Tick, scientific name: Amblyomma americanum. It is so powerful it can change your diet preferences immediately. Whether you want it or not. This bug was named after the small silver “star” at the center of its back. This tiny bug is widespread in wooden areas and forests in the Midwestern United States, primarily in central Wisconsin, Texas, and Maine. Sightings have also been reported in Colombia, Ecuador, Guatemala and Quebec. They are often found in dry forested sites with shrub undergrowth and along rivers and streams near animal resting places. In Maine, lone star ticks are relatively rare in comparison to the state’s other tick species, but they are being found more frequently than in the past. 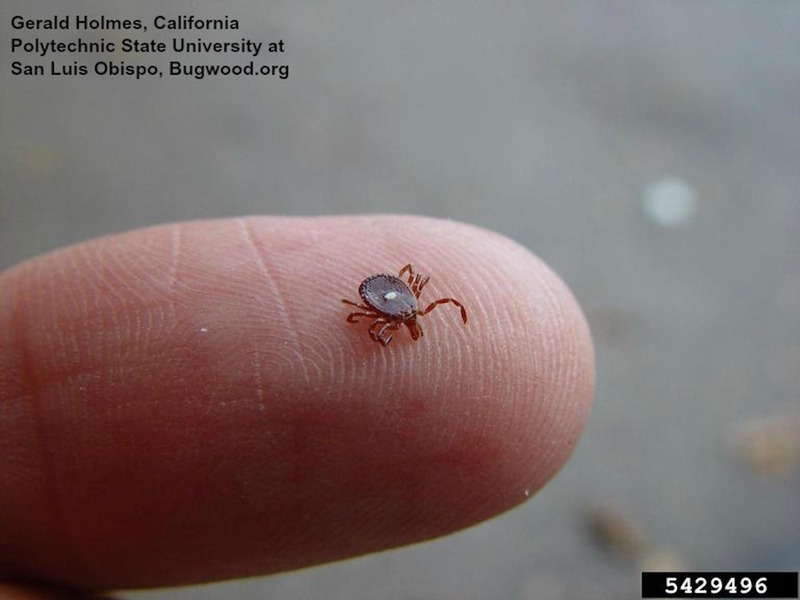 Lone star ticks tend to have a more rounded body shape than other common tick species. Adult females are approximately ¼ inch long and up to ½ inch or longer when fully engorged. Coloration ranges from reddish-brown to tan, with adult females being distinguished by a single white spot on the back. The color of this spot can vary from white to cream or bronze/gold and may take on an iridescent look at close range. Adult males typically have light colored patterns along the outer margins of the body. Recent studies have shown that one bite from this tiny red tick causes a severe allergy to meat that you’ll permanently take it off the menu. The Lone Star Tick’s saliva carries an alpha-gal that enters the bloodstream. Its bite can release an antibody into its victims that makes them allergic to alpha-gal, a sugar found naturally in meat and products made from mammals. When this alpha-gal from the tick enters our bodies via our blood stream, our immune system identifies it as a threat and releases antibodies to combat the intrusion. This results in an allergic reaction that includes hives, swelling and vomiting. In severe cases, some people choke and lose their breath. This little thing causes a whole lot of havoc. From thereon, anytime a Lone Star Tick victim exposes themselves to food containing alpha-gal, namely meat, the very same allergies arise. For people who are overweight, or suffering from high blood cholesterol and hypertension, this is a whole heap of good news. Because who wouldn’t want to get healthier and live longer, right? On the other hand, if you enjoy eating meat, you won’t appreciate having to give up your favorite food of choice. Luckily, fish and poultry are alpha-gal-free so if you are bitten by the Lone Star Tick, there won’t be any harm in eating fish, chicken and eggs. All you need to do is avoid red meat or any other mammal meat to keep from itching, swelling, choking and vomiting. You will never ride an elephant again after watching this video. We all love elephants. As kids, we all looked forward to seeing elephants perform on the circus. There’s always something exciting about watching these huge animals do their tricks. Growing up as adults, riding one is probably on your list when you go on vacation somewhere in Southeast Asia. Unknown to most of us, however, is the tragic reality behind the elephant tourism industry. Elephants are tor tured before they become “useful” for elephant tourism. OMG! That’s probably one of the biggest crocodiles ever! I’ll admit it right here – few creatures scare me more than a crocodile. I mean I’ve seen these creatures locked in zoos but each time I do, I couldn’t help but imagine how terrible it would be if a person accidentally fell into the cage. Those big sharp teeth are definitely the stuff of nightmares! I should probably blame the movies for my paranoia. Villagers Slaughter Gigantic Snake Thinking it Ate an Animal, Turns Out it was Pregnant! Nigerian villagers thought that the python looked huge because it had eaten an animal, but they found out it was actually pregnant with dozens of eggs. The residents of a village in Nigeria were recently on alert after a farmer lost a calf. The village was surrounded by wilderness, so the Nigerian villagers assumed that the animal was eaten by a snake. More specifically, they profiled the culprit as a python. Thus, the villagers got fired up when they spotted an African rock python whose belly looked swollen. Just because the animal looked like it had eaten something huge, the Nigerian villagers immediately tagged it as the main suspect in the calf's disappearance.